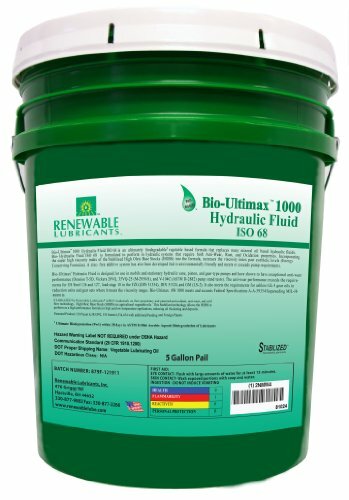 Renewable Lubricants Bio-Hydraulic fluids, Bio-Ultimax 1000 is ultimately biodegradable vegetable based formulas that replace mineral oil based hydraulic fluids. Bio-Ultimax hydraulic fluids are formulated to perform in hydraulic systems that require Anti-Wear (AW), anti-rust, anti-oxidation, anti-foam, and demulsibility properties. They are highly inhibited against moisture and rusting in both fresh and sea water and pass both A and B sequences of the ASTM D-665 turbine Oil Rust Test. Incorporating the super high viscosity index of the Stabilized High Oleic Base Stocks (HOBS) into the formula, increases the viscosity index past synthetic levels (Energy Conserving Formulas). Zinc-free additive systems have also been developed that are environmentally friendly and meet or exceed pump requirements. Bio-Ultimax hydraulic fluids are designed for use in mobile and stationary hydraulic vane, piston, and gear-type pumps and have shown to have exceptional anti-wear performance. Very little wear was encountered, 0 to 25mg (Pass), in accelerated biobased tests using Denison T-5D, vickers 20VQ, 35VQ-25 (M-2950-S), and V-104C (ASTM D-2882) pump stand tests at pressures and temperatures ranging from 2000 to 3000 psi and from 150 to 210 degree F. The anti-wear performance exceeds the requirements for US Steel 126 and 127, load stage 10 in the FZG (DIN 51354), DIN 51524, and GM (LS-2). They also meet the requirements for ashless GL-3 gear oils in reduction units and gear sets where they meet the viscosity ranges. Bio-Ultimax AW 1000 meets and exceeds Federal Specifications A-A-59354 Superseding MIL-H-46001D. If you have any questions about this product by Renewable Lubricants, contact us by completing and submitting the form below. If you are looking for a specif part number, please include it with your message.